As per the guidance of Paratpar Guru Dr Athavale, seekers have been advised to chant ‘Om Namo Bhagavate Vasudevaya |’ which is a chant pertaining to Deity Shrikrushna. This chant is especially conducive for spiritual growth and protection during current times and the years up to 2023. Dr Pradeep B Deshpande is Professor Emeritus of Chemical Engineering at the University of Louisville. He is also the President & CEO of Six Sigma & Advanced Controls, Inc., a company that he founded. He visited the Spiritual Research Centre and Ashram on 17th January 2015 as he was very fascinated by the spiritual research being performed at the Centre and the appearance of Divine particles in the Ashram premises. He had brought with him a GDV camera Bio-well, an instrument that shows the state of a person’s energy field and chakras. Using this instrument, it was planned to conduct an experiment on a few seekers. The purpose of the experiment was to check the effect of chanting ‘Om Namo Bhagavate Vasudevaya |’ on seekers when they were in the Ashram spiritual healing room. This room had been previously lived in by H.H. 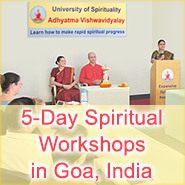 Dr Athavale, who is the founder of the Maharshi University of Spirituality. He stayed in the room from Dec 2006 – Jun 2007. Items such as the cupboard and the mirror that He used have been preserved in that room. The room is very spiritually positive. This is because the objects (room, items, etc.) used by Saints with a very high spiritual level, like H.H. Dr Athavale, contain very high positive energy, which is spiritually beneficial to others. Higher level Saints have said that chanting in that particular room is 3 times more effective as compared to chanting in an average place. We asked each of the seekers taking part in the experiment to come one-by-one and take a reading on the GDV camera Bio-Well. This was the baseline reading. After they had taken their reading, we asked them to enter the Ashram spiritual healing room and chant for 40 minutes. 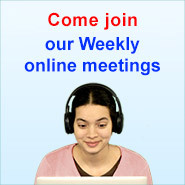 These 40 minutes of chanting would be the equivalent of 2 hours of chanting in any other average place. We ensured that the Ashram spiritual healing room was empty and only one seeker chanted in that room at any given time. This was to ensure that the seeker taking part in the experiment was not affected by the vibrations from any other seeker. The only stimulus was the chant and the special spiritual nature of the Ashram spiritual healing room. After completing their chanting session, we took another reading on the same machine to understand the effect of the 40 minutes of chanting in the Ashram spiritual healing room. The following is an example of a Bio-well GDV comparing an unhealthy and a healthy person. Sample energy fields comparing an unhealthy and a healthy person are shown on the left and a comparison of the state of the chakras of an unhealthy and a healthy person are shown on the right. There were significant variations in readings of the experiment before and after the 40-minute chanting session. Below, we have provided two such readings of seekers who had taken part in the experiment. Spiritual distress : means that a person has negative vibrations. This is caused due to spiritual reasons such as being affected or possessed by negative energies, ancestral problems, etc. If the negative vibrations are more than 50%, it is considered severe. 30-49% is considered moderate and below 30% is considered mild. 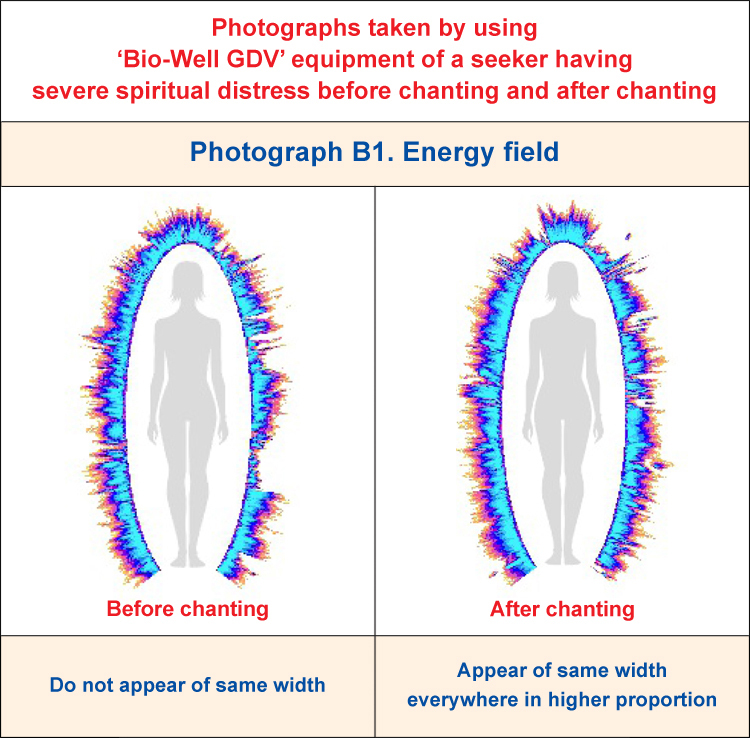 Bio-energy field: In the diagram below, the bio-field of the seeker (not having any distress) is displayed and it shows the reading of the energy field before (image on the left) and after (image on the right) chanting ‘Om Namo Bhagavate Vasudevaya |’ for 40 minutes in the Ashram spiritual healing room. You will notice that the image on the left shows gaps and sharper spikes in the person’s bio-field. This image represents the person’s bio-field prior to her chanting. 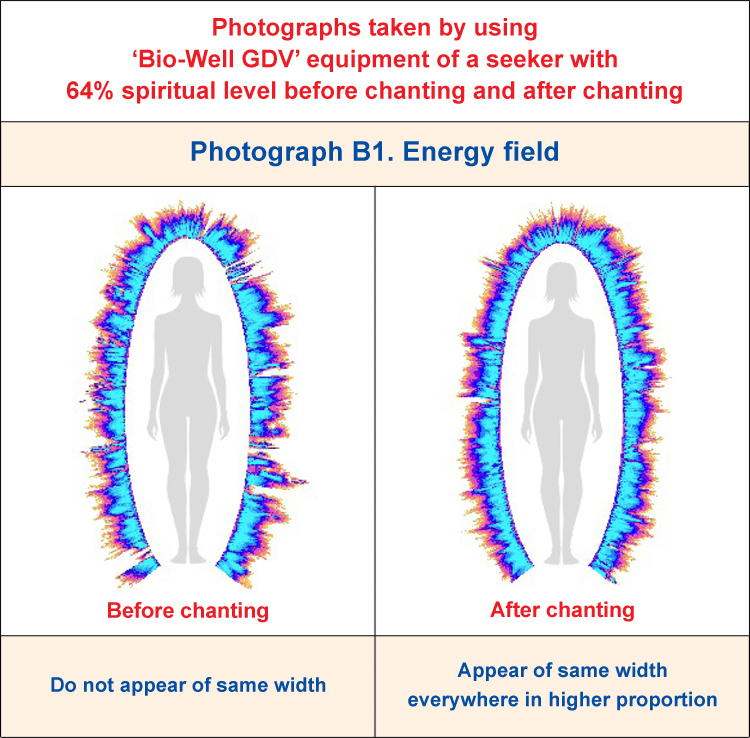 On the other hand, the bio-field image on the right, which is an illustration of the person’s energy field after chanting, appears to be much healthier. This means that there are no gaps and the thickness in the field is relatively even compared to the previous reading. How the software displays chakras is important when analysing them. 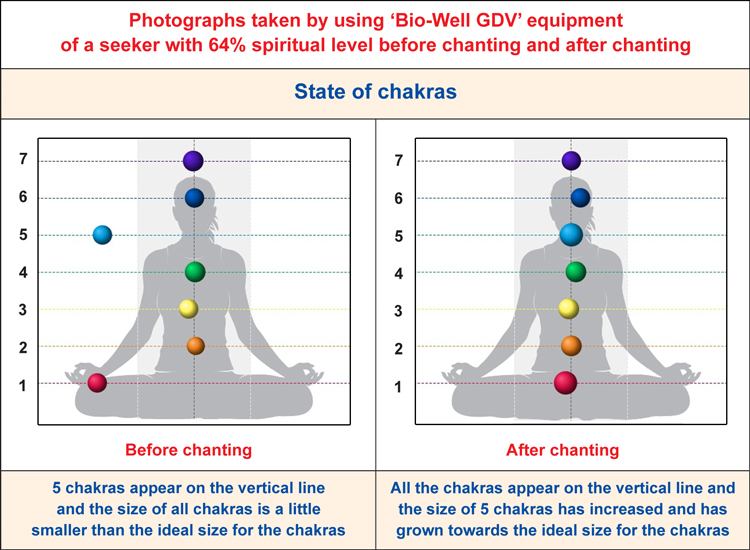 Location and size are the two parameters used to show the state of the chakras. The ideal position of a healthy individual (physically and mentally) is when the chakras are aligned on an imaginary vertical centre line and their size is ideal, i.e., neither large nor small. When a person is mentally and/or physically unbalanced the chakras are not aligned and their size is small as compared to the ideal size. This small size indicates lack of energy. 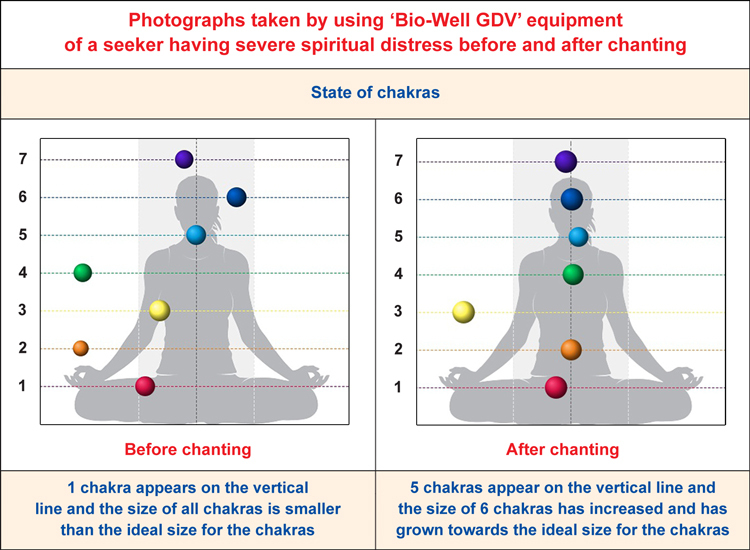 Refer to the two chakra diagram reports below of the seeker (without distress) when taking part in the experiment. As this seeker has a higher spiritual level, most of the chakras are already aligned with the exception of two chakras, namely the Vishuddha (Throat) and Muladhar (Root) chakras. However here too, one can see after a mere 40 minutes of chanting in a spiritually charged environment, the seeker’s chakras all got nearly aligned. The size of the chakras has also increased to be nearer to ideal. The above figures are measured in joules (x 10-2) and 5 joules (x 10-2) is considered to be ideal. 5 of the 7 chakras’ sizes have improved towards being more ideal. Alignment refers to a balanced state of the chakras, which affects physical, psychological and spiritual well-being. The more they are aligned towards the centre the more balanced the chakras are. Here we see a big difference in alignment. The balance improved in 5 chakras out of 7. The Mūlādhār-chakra and the Vishuddha-chakra which were quite misaligned have come close to being completely aligned. This shows that overall stress reduced while the energy and balance increased. Bio-energy field: Compared to seeker 1, this seeker’s pre-chanting field is far more broken and the gaps are far more noticeable. This was primarily due to the spiritual distress she suffered from. However, after 40 minutes of chanting there is a remarkable positive change, wherein the bio-field appears of the same width all over to a greater extent. Chakras: The pre-chanting position of the chakras illustrates that there is severe misalignment of the chakras. This is generally indicative of a person who is unwell. In this case, through spiritual research, we understand that this is due to the seeker being afflicted with spiritual distress. The seeker physically was and is in a healthy state with no known major physical illnesses. However, after 40 minutes of chanting in the ashram meditation room there is a dramatic alignment of the chakras. 6 of the 7 chakras’ sizes have improved towards being more ideal. The balance improved significantly in 5 chakras out of 7. The Maṇipur-chakra and Vishuddha-chakra are less aligned. It shows that overall stress reduced marginally, while the energy and balance increased considerably. In both seekers, there were significant changes for the positive in both the aura and chakra readings after just 40 minutes of chanting in the spiritually positive Ashram spiritual healing room. This shows the importance and efficacy of the chant ‘Om Namo Bhagavate Vasudevaya |’ and the importance of following the guidance of a Paratpar Guru (H.H. Dr Athavale). It also shows the importance of chanting in spiritually pure areas as it acts as a booster for one’s spiritual practice. It is also the reason why it is recommended to visit Holy places for one’s spiritual practice. Dr Pradeep B Deshpande who conducted this experiment was quite amazed by this change and stated that it generally takes months to facilitate such a change. He made this statement based on his extensive research experience using the GDV camera Bio-Well. Who is a Guru and How to Find Him?